Arriving in Iran I was a bit overwhelmed by the big interest people suddenly had in two sweaty and dirty idiots on their bicycles. The other side of the river that’s Azerbaijan. Azerbaijan is mainly east of Armenia but has an island of it’s territory west of Armenia too, this is the west part viewed from the Iranian side. This is in Tabriz. Seems like Iran is swimming in mellons, you can buy them everywhere and at any time of the day. Here’s a company I played for in Firouzabad. The guy on the phone is some local politician and they said he’s from Ahmadinejad’s party so I was a bit concerned but they let me play on the street. In Iran they have by the way lemon ice cream with noodles in it. 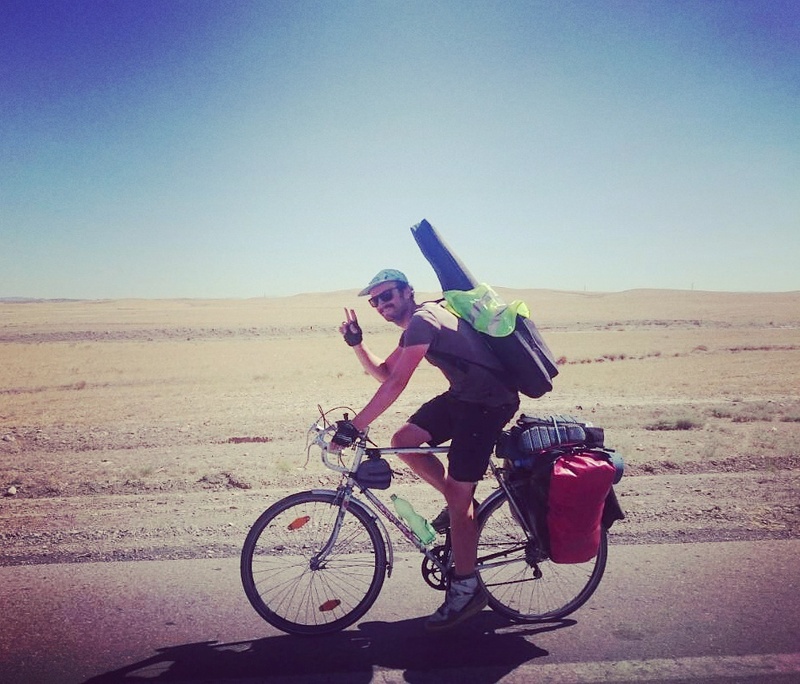 Somewhere on the way Tom had to flight back to Australia and so I kept on cycling on my own through the Iranian mountains, slowly approaching the Caspian Sea only that now it was very hot, dry and no more trees that would spend some shadow. This is after Khalkhal on the way down to the Caspian Sea. In general Iran is very dry and hot but towards the sea it get more humid (and hot). In this djungle they told me used to live the caspian tiger before it went extinct. I went this way on a friday and the whole 50km were like a big festival area were Iranians go on their weekend to do barbecue. Seems like the entire coast of the Caspian Sea is a holiday resort where Iranians from the south go in summer to escape the heat. Still it’s bloody hot and doesn’t get much colder at night. On the road random people stop do do selfies. I must be on plenty iranian selfie-instagram channels. These guys were pretty chillaxed and wearing a shirt with an America flag in Iran is kind of a statement. Ramsar is an old bathing place in the Mazandaran province south of the Alborz mountains. With enjoyable +40 degrees and 85% humidity. What I understood about mountains is that the higher you get the colder it gets. Now the Caspian Sea is a huge depression at 28 meters below sea level, so you can imagine it is very hot there plus the humidity is really high which makes it super exhausting to cycle. Somewhere on the way I must had a bad kebab or heat humidity and overall exhaustion did their job but somewhere on the Caspian Sea I started to feel my physical limits. Thankfully Iranians are very hospitable people, especially I have to thank Mohammad from Gorgan who helped me regain my strength. This is after another breakfast concert in Bojnurd. Breakfast in Iran is usually Omlette which means Eggs and tomato paste. This is when I stayed at the red crescent. I played some songs for them and they liked my guitar and made kebab. I always thought headwinds is the worst but actually strong wind from the side is even worse, pushing you of the road into the gravel. At higher altitude the temperatures are dropping at least at night. This is already after Mashhad in the desert on the way to the Turkmenistan border. Cycling the whole day in the heat of the east Iranian desert without a single bit of shadow. Anyways, after facing a massive police presence around the border I took a train back to Mashhad an waited another five days until I eventually gave up, packed up my bike and took a plane to cross Turkmenistan by air. However, I spend some exciting days in Mashhad, spending half a day in the immigration office to extend my Iranian Visa where I met some Afghans who fortunately spoke german (with a swiss acent) and helped me out, playing a little concert in a money exchange office and here’s a song I played in the backyard of my guesthouse. Thanks to Sanaz for filming!